Hi, I have made a little 'melody', it has drums. However I had to go through alot of trouble and use tons of gates, just to switch between which pattern sequencer to be using. As you can see in the image it uses 2 pattern sequencers. It does the first 7 times, and the second the 8th time. Then starts from beginning. There must be a simpler way to do this, any suggestions? Example is attached (if you can stand to listen to my little melody, hehe. Okay here are some suggestions. Its a GateSeq with 8 bit lines instead of 1, would be handy for drums. I think they all need an "act" input (like some have) so they easier can be controlled from a sequence controller of some sort. Okay, I looked at some Eurorack sequencers, made some brainstorming, and tried to design something for sequencing whole songs or patterns. 1 - Must be able to cover several minutes if not tens of minutes. 2 - Does not have to be super easy to learn, but must be super fast to use. Don't wanna spend 3 hours programming 10 minutes of music. 3 - Should be able to be programmed while its playing. 4 - Should be easy to see how far its into the 'song'. 5 - Decent userinterface that does not give the feeling of making code. prog=prog/disp mode. Program mode or display current step. Click on a part 'l', a section 'l', and a element 'l', then program the bits. The 'l' turn yellow when selected. Notice it should also play in Prog mode, except you cannot see how far it is. Click on any 'l' to play from there. Bits are locked and cannot be set. Hmm, maybe if increase number of bits out then can make song more varied, and have to cascade less sequencers. With high clockrate can make it control stuff directly or almost directly, like drums/sounds/notes etc. For lower clockrates can make hour(s) long song, where output bits control different aspects of music/soundscape being active. Maybe the 2 settings of bits (on/pulse), "pulse" be very short, and "on" kept till next element is started. So not follow clock pulse width. Since it can take a while to get a good program running, maybe also a save/load button. So can try out different programs in same patch. I've made some act inputs on modules. Re. the ScoreSequencer - I do not understand it at all ... does the image map to the text or should I forget about the image? Okay I will in the coming days make a little video that explains it. I forgot to mention: When in display mode I imagined the bit controls, should not be clickable. Actually in display mode, to save CPU, they don't even have to change during melody, as the output lights will show what is going on. Also I imagine the bits can be used not only to turn stuff on and off, but also to control modification to sounds. So 1 sound maybe use 4 of the output bits to control when its played, and also how it should sound. So we have Parts, Sections, Elements and Bits. Copy a section: should that copy the section number from the previous part or the previous section of the same part? And likewise, should it be cyclic? Yes, sorry I did not mean melody. Copy previous part do not have to be cyclic in my opinion. Copy previous section should copy previous section inside same part. Also dont think it needs to be cyclic. Same for elements. Ok, drawing the thing up now (there is no code yet) - wondering how chaining could work, so left that out for now. Since there is lights on the output lines, I think the lights underneath the bit controls is not needed though, but up to you of-course. Heh, was just going to ask what the lights beneath the buttons should do - ok, out they go. Another question - when it is in run (display) mode - should the copy and clr buttons be disabled? seems to make most sense to me. I agree, otherwise it might confuse. This is a sequencer that meant to be used for drum patterns, and it controls three drum lines at the same time. A pattern is composed of Parts (P) where each part holds eight Sections (S) and each section has eight Elements (E). Each Element has three Bits corresponding to the Bit outputs. Each bit can be in one of three states, it outputs nothing (thin white base line) it outputs a positive value while its selected and the clock is high (a half block on the left side) or it outputs a value during the entire bit duration (a full block). At any one time eight elements are visible for a combintation of the current Part and the current Section. The sequeencer is driven from the clk input, but it only runs when the act input is not connected or when it is set to a positive vaue. the res input will make the sequencer start at Part1, Section 1 and Element 1. The sequencer has two modes, Run mode and Edit mode. In run mode the pattern will be played one Element after the other, and when all were played a move is made to the next Section. Then when all Sections were played the next Part will kick in. this makes for a total sequence length of 512 steps. The active Part, Section and element are indicated by a green color. When all parts were played it depends on the the mode what will happen. In Loop mode the sequencer jumps back to the beginning, Part 1, Section 1 and Elemment 1. 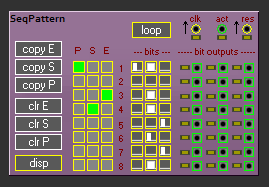 In Once mode there will be no further output, all the bit ouputs will be set to off. Red colored states are skip states and will not be played. When all Parts, Sections and elements are red nothing will be played. When in Run mode a Part, Section or Element button is clicked the sequence will jump to that point on the next clock. When in run mode one of the bits bottons is clicked it will proceed to the next state (off to half to full to off again). In Edit mode the progress of the sequencer is not shown in the P, S and E controls, but it will keep playing the way as it does in Run mode. The lights at the bit outputs will still show what is happening. In Edit mode you can select a specific Part, Section, Element combination with the with the P, S and E buttons. It is then possible to easily edit the 24 bit buttons with the sequencer running away from it. In edit mode the edit buttons (copy E, copy S, copy P, clr E, clr S and clr P) become functional. They will copy or clear Elements, Sections or Parts. Copy E will copy to the active Element the previous Element, when the active Element is 1 nothing will be copied. clr E will clear the three bits for that element to the off state. Copy S will copy to the active Section the previous Section, when the active Section is 1 nothing will be copied. clr S will clear all bits in the current Section (that is 8 sets of three bits). Copy P will copy to the active Part the previous Part, when the active Part is 1 nothing will be copied. clr P will clear all bits in the current Part (that is 8 times 8 sets of three bits). Oops, I must have explained something in the wrong way. Sorry. If you look at my post where I first talk about this I mention a simple GatePatternSeq, that combined with adding act inputs would for me be enough for sequencing drums I thought. 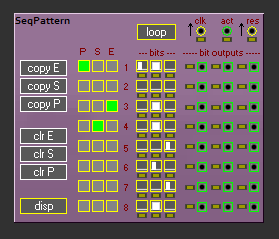 The SeqPattern as you have called it was meant for controlling a whole song/soundscape, and as such 3 bits per step would not be enough. I meant for all 24 bits to be inside each Element. Such that you would have in total 512 steps, and 24 bits output for each of those states, not 3. Well, at high clock rates it could also be used to control drums (and sounds), but was not the only motivation. That being said, I like your addition of clicking on a part/section/element in run mode will make it jump there. It was also hard to explain it with a bunch of static images in video. So in total there will be 8 * 8 * 8 * 8 = 4096 steps, right? that is .. a lot .. maybe should add a new state for the E S P buttons .. like blue .. when it hits blue it will stop in once mode and reset in loop mode. And add a couple more blinkers to show the bits being played within an Element - or could highkight one of the numbers 1 .. 8. And no worries, I did not program anything yet. Edit : oh oops .. misread again ... 512 steps with 24 output bits .. ok. No extra lights needed then .. still considering the blue thing for reset. This is a sequencer that meant to be used for drum patterns, and it controls 24 drum lines at the same time. A full drum pattern is composed of Parts (P) where each Part holds eight Sections (S). Each Section has eight Elements (E) and each Element has 24 Bits (buttons) corresponding to the Bit outputs. Each bit can be in one of three states, it outputs nothing (thin white base line) it outputs a positive value while it is selected and the clock is high (a half block on the left side) or it outputs a positive value during the entire bit duration (a full block). At any one time 24 bits are visible for a combintation of the current Part, Section and Element. The sequencer is driven from the 'clk' input, but it only runs when the 'act' input is either not connected or when it is set to a positive vaue. the 'res' input, when going positive, will make the sequencer restart at Part 1, Section 1 and Element 1. The sequencer has two modes, 'Run' mode and 'Edit' mode. In 'Run' mode the pattern will be played one Element at a time, moving to the next one on the next clock. When all Elements were played a move is made to the next Section. Then when all Sections were played the next Part will kick in. This makes for a total sequence length of 8 x 8 x 8 = 512 steps. In 'Run' mode the active Part, Section and Element are indicated by a green color. When all parts were played it depends on the the mode what will happen next. In 'Loop' mode the sequencer jumps back to the beginning, Part 1, Section 1 and Elemment 1. In 'Once' mode there will be no further output, all the bit ouputs will be set to off. Red colored states are skip states and will not be played. Blue colored states act as a reset in 'Loop' mode and as an endpoint in 'Once' mode. When all Parts, Sections and Elements are red nothing will be played. When in 'Run' mode a Part, Section or Element button is clicked the sequence will jump to that point on the next clock. Clicking on a red button will skip to the first non red one after it. Clicking after a blue point is possible, and will just jump to that point. In 'Run' mode the active E, S and P buttons will be colored green. The skipped ones are red, the reset ones are blue and all others are gray. So when you see any green E, S or P buttons, you know the sequencer is in 'Run' mode. In 'Edit' mode the progress of the sequencer is not shown in the P, S and E controls, but it will keep playing the way as it does in 'Run' mode. The lights at the bit outputs will still show what is happening. In 'Edit' mode you can select a specific Part, Section, Element combination with the P, S and E buttons, the button will turn yellow then. It is then possible to easily edit the 24 bit buttons without the sequencer running away from it. In 'Edit' mode the edit buttons ('copy E', 'copy S', 'copy P', 'clr E', 'clr S' and 'clr P') become functional. They will copy or clear Elements, Sections or Parts. 'copy E' will copy the previous Element to the selected one, when the selected Element is 1 nothing will be copied. 'clr E' will clear the 24 bits for that element to the off state. 'Copy S' will copy the previous Section to the selected one, when the selected Section is 1 nothing will be copied. 'clr S' will clear all bits in the current Section (that is eight tiems 24 bits). 'copy P' will copy the previous Part to the selected one, when the selected Part is 1 nothing will be copied. 'clr P' will clear all bits in the current Part (that is eight tiems eight times 24 bits). Clicking once an E, S, or P button will select the associated Element, Section or Part (yellow). Clicking again will make the the button red, meaning it will be skipped on playback. Clicking yet another ttime will make it blue. Making a button read does not clear any bits. A blue button acts as a reset point, and making a button blue does not cler anything either. In 'Edit' mode unselected and non skipped and non reset buttons will be gray. So you know that when you see any yellow E, S or P buttons you know the sequencer is in 'Edit' mode. I like the yellow vs. green color to distinguish the edit and run mode. Now I need to first make some trickery ... this will be the first module I've made where the graphical representation does not have enough state to hold all the data from the synth module it controls. And I need be able to store it there for the patch reader / writer. Ok, that bit works, can now store arbitrary info on the patch module which will be loaded and saved. The patch format needed no changes for this. Now some more trickery is needed to transfer it, in both directions, between the patch module and the synth module. That is for next week I think, a busy weekend coming up. but it made its first baby steps today ... lots of administrative stuff to get right on this one. Will get it working too I think, or at least not seeing any serious obstacles anymore. A lil progress ... skips and resets not working properly yet and the ouput bit timing is not ok .. screen elements are not updated always ... it does seem to load and save ok now though with patches. Looks very cool. Let me know when someone writes the manual and does tutorials.